Lower Back Pain Cause: A herniated disc or hip flexors in spasm. Look at the evidence so you can decide. If it is possible for your neck, back, shoulder, knee or hip pain to be muscular, how will this ever be diagnosed? Lower back pain is the number one area for pain. It is debilitating and can make life a living hell. It becomes difficult to stand, sit, walk, work and sometimes even sleep. You decide it is time to seek medical assistance in resolving the pain. You see your primary care physician or you are referred to an orthopedist, neurologist or you just go on our own to the local chiropractor. Ultimately, you are going to be told that an MRI is needed to diagnose the cause of your pain. The results of the MRI come back and you are found to have a herniated disc, stenosis, a pinched nerve or arthritis. You are told that since one of these or a combination of these are identified for the first time at the time you are having pain that this is the cause. All treatments are directed toward these structural variations. Whether it is epidural nerve blocks, chiropractic care, physical therapy or any other form of treatment, the tissue that is supposedly in distress is the identified structural variation/s. There are no other indicators that the structural variation/s are the cause of your pain. It is strictly based on one premise. The structural variation/s were found at the time you are having pain and therefore it is the cause of the pain. Let’s briefly discuss pain and why it is elicited. Pain is part of the emergency protective system of the body. it is a kind of alarm that allows you to become aware of when a tissue in the body is functioning properly. The most important thing to understand is that the pain begins at the inception of the distress of the tissue eliciting the pain. So if a tissue is said to be the one in distress eliciting the pain and there is a chance that the supposed distress of the tissue occurred before the pain began then clearly it cannot be the true tissue in distress eliciting the pain being experienced. If we take the case of the herniated disc, pinched nerve, stenosis or arthritis, if your pain began yesterday and an MRI says that one or a combination of these structural variations is causing your pain, then that means that they could not have existed before yesterday. So if an MRI were taken 2 days prior, none of these would have shown up. Does anybody believe that a herniated disc, pinched nerve, stenosis or arthritis developed in just one day? These occur as slow and progressive processes. They take years to develop. That is why if an MRI were taken even a year before your pain began, the results would be identical to the one taken when you were in pain. The fact that a structural variation is identified on an MRI is a self fulfilling prophecy. As people age they develop structural variations due to the wear and tear of life. Whether a person is in pain or not, whether they are 5 foot tall or 6 foot tall, whether they have blond hair or brown, an MRI is going to find structural variations. The fact that they are found for the first time at the time you are having pain allows the assertion to be made that it is causing the pain but there is no question that the structural variation existed well before you had pain and therefore it could not be the cause of your pain. This can be clarified by looking at studies of people who have no back pain. 90% of people over the age of 60 were found to have bulging or degenerative discs. They had no pain and yet still were found to have structural variations. Now remember that MRIs cannot identify muscular causes of pain. Let’s take for instance the hip flexors (psoas major and minor) straining and going into spasm. These muscles attach to all 5 lumbar spine. 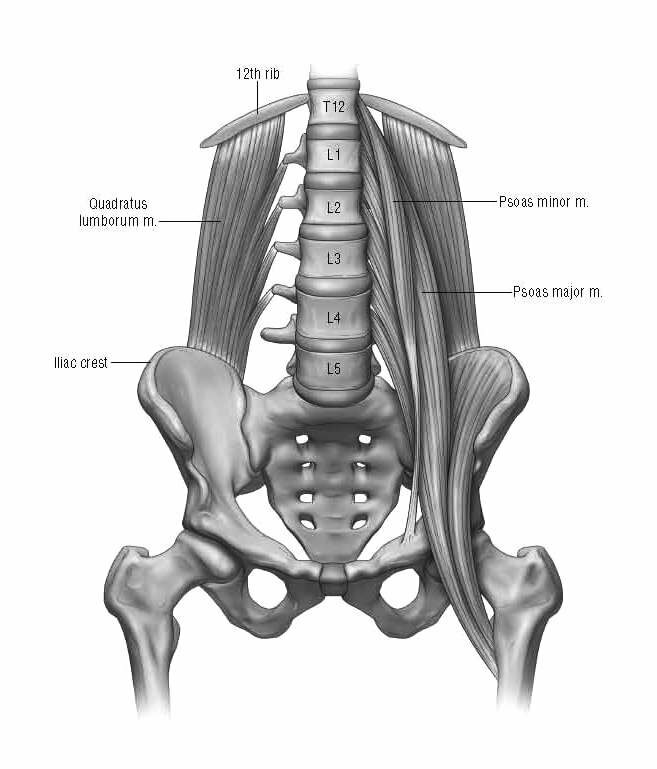 If these muscles were to strain they can certainly elicit pain at their attachment to the lumbar spine. This would create pain at the lower back near the spine that could easily be confused as coming from a structural element of the spine. Here is the difference between depending strictly on an MRI and interpreting the body’s presentation of symptoms. There would be other symptoms in the body’s presentation to help confirm that the hip flexors were the cause of the lower back pain. First, the person would be seen to have a severe arching of the lower back. Excessive arching comes from the shortened hip flexors. Difficulty sitting for a long period of time would be a problem due to shortened and strained hip flexors. This is because for you to sit the back must go from a mildly arched posture to a hunched posture. Due to the excessive arching the lower back can not move into the hunched posture required for normal sitting and tension placed on the hip flexors would cause them to elicit pain. Trying to stand after sitting would be very difficult and would require assistance by pushing up on the thighs with the hands to stand fully upright. This is because the hip flexors need to lengthen back to their normal length when going from sitting to standing and since they are severely shortened they make it difficult to lengthen. The assistance of the hands on the thighs is used to help lengthen the hip flexors. Reaching down to the floor is difficult for the same reason. Touching the hip flexors would insight pain as they are tender due to being strained. A flexibility test of the hip flexors would show that they are severely shortened. Muscle testing the hip flexors versus their opposing muscle the gluteus maximus would show a severe imbalance with the hip flexors being much stronger which is what is leading to them shortening. Look at all the physical indicators that are present to prove that the cause of the lower back pain is shortened and strained hip flexors versus a completely baseless acceptance that because a structural variation is identified for the first time at the time pain exists means it is causing the pain. If your body presented with all of these physical indicators wouldn’t it be clear that the tissue in distress emitting the lower back pain is the hip flexors and the herniated disc, stenosis, pinched nerve or arthritis is simply existing and not eliciting pain just like with the 90% of people over the age of 60 who have no back pain but have bulging or degenerative discs? You have been coerced into believing that the mere identification of a structural variation means it needs to be treated. This is a fallacy. Post-mortem studies from the 1950s showed over 40% of the population had herniated discs and yet none of these people were ever treated for pain. You must accept that the MRI is baseless and the identification of structural variations identified for the first time when pain exists does not mean it is the cause of the pain. The Yass method interprets the body’s presentation of symptoms to identify the tissue in distress eliciting the pain being experienced. When found to be muscular which I have proven to be the case in more than 95% of symptoms, the body presents with many different physical indicators to help confirm the diagnosis. Altered posture, altered movement patterns, decreased functional capacity, altered flexibility, altered or imbalanced muscle strength, tenderness experienced with touching the muscle are all signs that confirm that a muscle is in distress. As I noted these types of causes will not be identified on an MRI and therefore remain sustained and continuing pain to be elicited. That is the only reason for chronic pain to exist; misdiagnosis leading to the wrong tissue being identified and treated and the distressed tissue remaining unidentified and eliciting the distress signal of pain. You want to get one of my books: The Pain Cure Rx or Overpower Pain, please click on one of the links below to order through Amazon.com. If you want to get the resistance bands needed to perform the targeted progressive resistance strength training exercises which are at the core of the Yass method’s ability to resolve pain due to muscular deficits, please click on one of the links below.